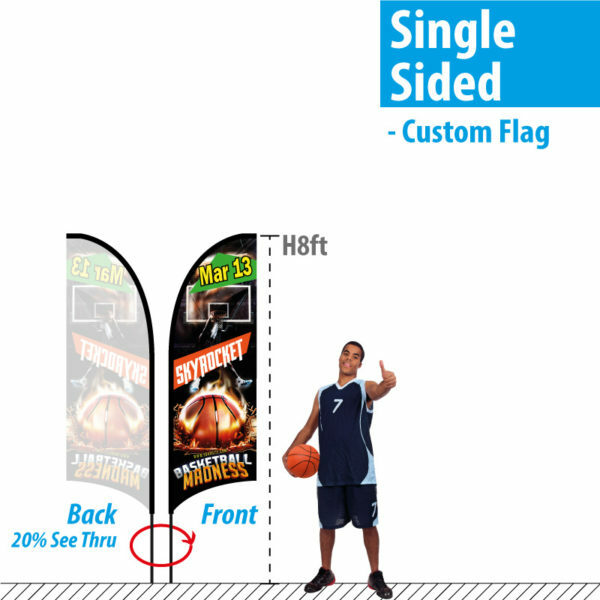 Please click on the Advertising Flag size you want, then Start Design your own Custom Feather Banner with our EASY Online Customization Tool. Enjoy the creation of your own sign graphic, FAST in just a few minutes. We offer our low wholesale discount on all our Feather Banner Flag products, without any minimum order quantity requirement. So Resellers and non-profits could enjoy extra savings for ordering even just one unit! Do you know most claimed themselves as Trade Show Display manufacturers, are just a print shop who have the facility to print? They would still need to source and buy the Display hardware from other manufacturers like us. ONE-economy.com is a fully equipped Trade Show Displays, and Banner Flag manufacturer. We manufacture all hardware and printing, and thus be able to keep a huge wholesale discount to keep a #1 ECONOMY pricing without sacrificing the quality of the products. So you do NOT get a Cheap Quality, while enjoying our Great ECONOMY price. Start Customize your Feather Flags now! 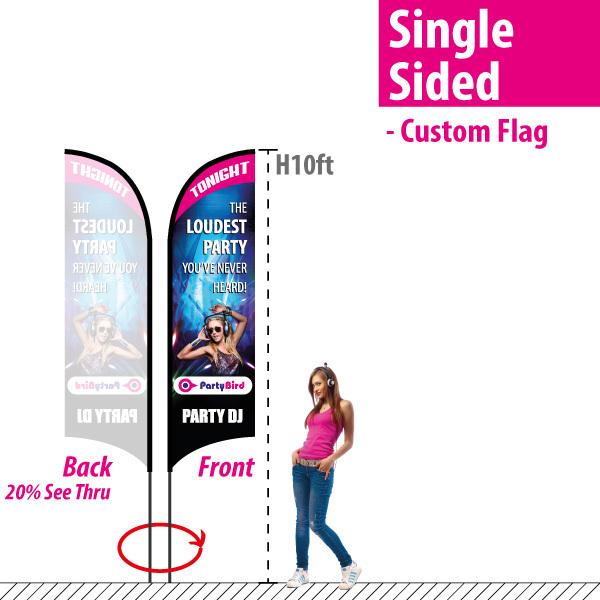 All our Feather Flags and Banners are printed with HD Photo Resolution and Color Quality Digital printing. All our Outdoor Display products (e.g. 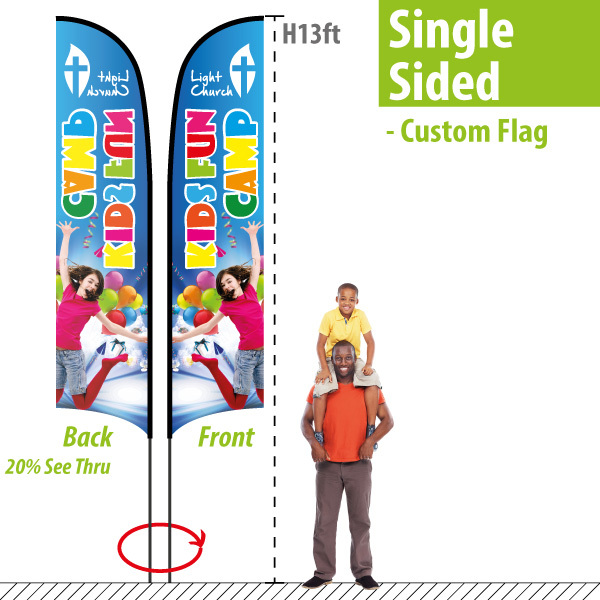 Feather Flags) are custom printed by the most durable Digital Dye-sublimation. This use thermal heat to fuse the dye (ink particle) with the polyester textiles. Our Sturdy flag poles features with fast Connectors for easy setup, while strong for heavy duty. We understand most purchases of Trade Show Displays and Banner Flags are for your important events with a very strict delivery deadline. No more worry about the arrival schedule of your order now! All orders come with an Estimated Delivery Date, for you to ensure it would be delivered on schedule for your events. Still not convienced with our Estimated Delivery Date? You could also let us know if you have any Strict Delivery Deadline, and want a Guaranteed arrival schedule! We provide 100% Full Guarantee on the AGREED Delivery Deadline. You could request a Full Refund, if it does not come on time as agreed.